Bangui (Agenzia Fides) - "We are pleased with how the project is proceeding and with the collaboration with Caritas of Central Africa and Caritas of Bambari" says Olivier Bonte, representative of Caritas Germany in the Democratic Republic of Congo, describing the activities of the three sister organizations to help the Central African refugees in the DRC due to the civil war that has been devastating their country since 2012. 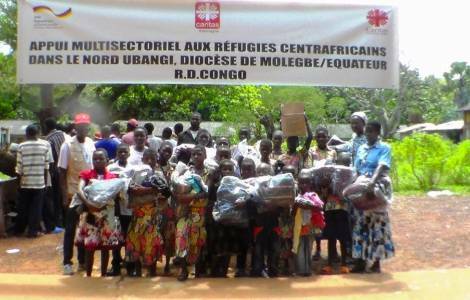 The efforts of the three Caritas are concentrated on both sides of the river Ubangi that marks the border between the DRC and the Central African Republic, so as to encourage the return of refugees in Central Africa. "Surely there are a lot of difficulties and the challenges are huge", says Bonte. "But we continue to seek assistance in Germany to increase our collaboration with the National Caritas of Central Africa and the diocesan Caritas". The main support offered is food, which consists not only in the distribution of food but also seeds, agricultural tools, and training courses. In the health field, a mobile clinic has been created that plays an essential role in allowing refugees to settle in their own Country. "The conditions for the return of refugees has to take place in an acceptable environment", emphasizes Bonte. "We do not expect to be able to do everything, but we are deepening what we can still offer in the health field. We also want to reflect on what can be done on nutrition and food security as well as on social cohesion". Fr. Luk Delf, head of Caritas Central Africa, says that his organization intends to be present where other structures have disappeared. "As Caritas we want to be present in areas abandoned by several other organizations. Despite the difficulties of access, we want to go among other things, to the areas around the rivers Kouango, Ndjoukou, Mobaye". However, the security conditions in the Central African Republic remain precarious and the repatriation of refugees is presented as an effort that will last over time.